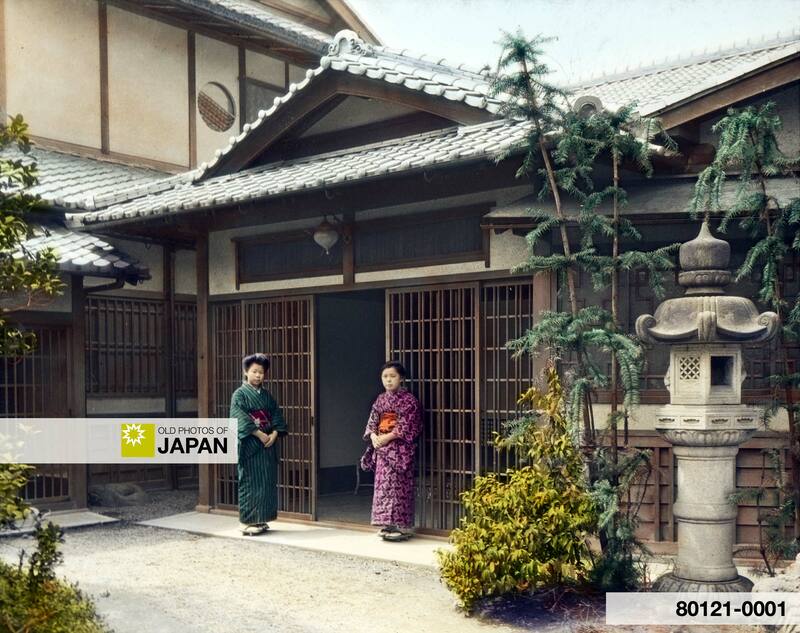 Two women in kimono stand at the entrance, called genkan (玄関), of a house of what appears to be a well-to-do family. There is a huge stone lantern and the large open area in front of the entrance suggests much space between the entrance and the gate. The word genkan was first introduced in the 17th century and used for a porch-like projection from the guard house or retainers room, built in the residences of leading warriors and shoguns.1 Other people were prohibited from having a genkan. By the 18th century, however, exceptions were made for rich merchants, village headmen, doctors and officials in charge of important shrines.2 During the Meiji Period (1868-1912) many rules like these were struck off the books and the genkan became an accepted part of an increasing number of houses. This photo was taken in the year after the horrendous Great Kanto Earthquake devastated Tokyo, Yokohama and surrounding areas. This disaster was the beginning of the end of this kind of wooden architecture. Japan’s wooden houses had fed fires for many centuries. In Tokyo, fires were so common they were called flowers of Edo (江戸の花). These greedy flowers were famous and attracted crowds just as large as the ones that showed up for the more peaceful hanami —the viewing of sakura (cherry blossom)— on the south-east bank of the Sumida River in Spring. Such fires were no small events. In 1657, a huge fire in Edo (current Tokyo) claimed over 100,000 lives. As late as 1879 and 1881 over 10,000 buildings were burnt down in large conflagrations. In 1892 some 4,000 structures were lost in a fire. They weren’t limited to Tokyo either. Just about every large Japanese city has one or more taika (大火, great fire) in its history books. Japanese had always rebuilt in wood, but after the Great Kanto Earthquake, many people choose to build ferro-concrete structures instead. After most of Japan’s cities were destroyed by fire bombs during WWII, wooden houses became more and more of a rarity in large cities. Soon Japan became so used to building in concrete that wooden housing even started to vanish from cities that had been spared from bombing, such as the city of Kyoto. Someone who looked out over this city during the sixties still saw a wide expanse of low wooden architecture. These days one sees mostly a concrete jungle interspersed with some historic temples and a few left-over machiya. Inouye also complains about how cold Japanese houses are during Winter, how susceptible they are to burglary, and how quickly they grow old and need to be torn down and replaced. His critical view of the Japanese house, although perhaps for different reasons, still seems to be shared by a large number of people in Japan. Many realtors will tell you that the majority of their customers prefer Western style housing. Foreign visitors though are generally deeply charmed by traditional Japanese architecture and lament its demise. An increasing number of Japanese are beginning to feel the same way and this has caused the foundation of organizations like for example the Japan Minka Reuse & Recycle Association, which preserves old minka (traditional Japanese farmhouses), the Conservation Association of Hatada House (家住宅活用保存会), an organization which teaches the importance of preserving traditional japanese architecture, and the Kyo Machiya Sakujigumi (京町家作事組), which preserves Kyoto’s beautiful machiya. 1 Japanese Architecture and Art Net Users System. genkan 玄関. Retrieved on 2008-10-15. 4 Although the above photo does not show a machiya, I would like to recommend Nick Coutts’ beautiful site about Kyoto Machiya and Kyoto City International Foundation’s Kyoto Machiya Tour for foreigners. You can also licence this image online: 80121-0001 @ MeijiShowa.com.